Some wrack added (I cannot remember what species and cannot tell from the picture, it did well though). A strawberry anemone Actinia fragacea on the right. A worm pipefish, dog whelk and hermit crab in front of the serrated wrack. There is a lot of algal growth and detritus on the wrack. (I have since bought a circulation pump to keep detritus in suspension so it can go into the filter, more about that later). Another go. The nice thing about having an aquarium with native species is that you can collect them yourself, which is half the fun (and free), and when something does not work out you just chuck it back and try something else. 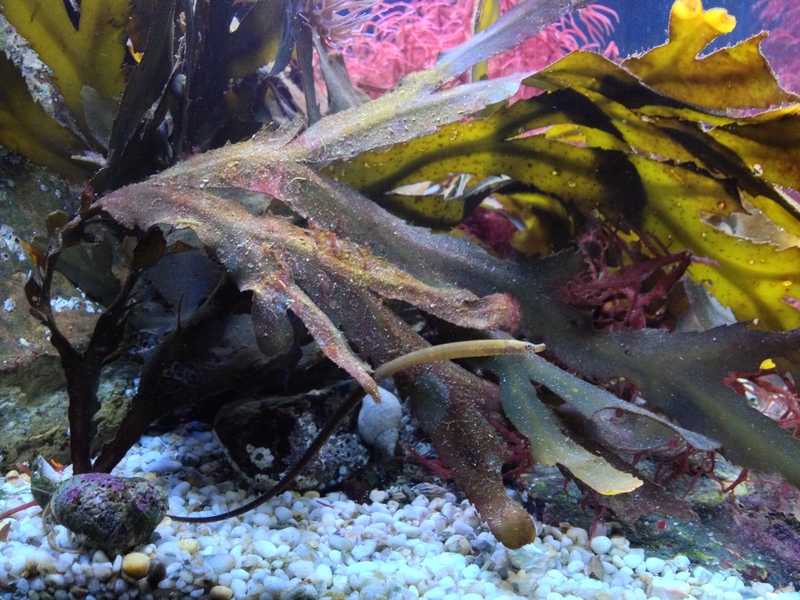 The green seaweed is velvet horn Codium tomentosum, the long brown seaweed is wireweed Sargassum muticum. Both did well, the wireweed grew quite fast, perhaps not a surprise as it is an invasive species in the UK. 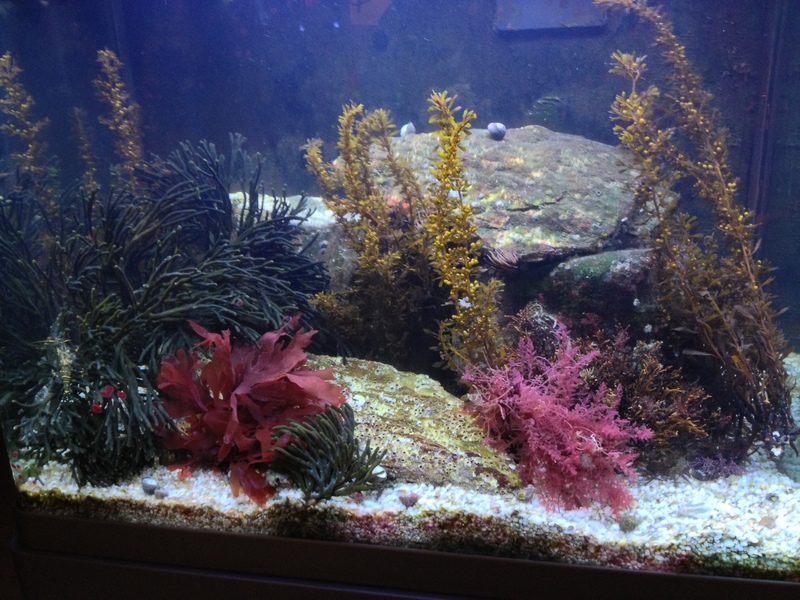 The red seaweed on the left is dulse Palmaria palmata, on the right harpoonweed Asparagopsis armata. The harpoonweed was not exactly thriving and the dulse was quickly eaten by the prawns: Recently, I noticed the Dudresnay’s whorled weed (love that name) sprouting from the rocks everywhere. This happened some months after removing a pluck of this weed from the aquarium. 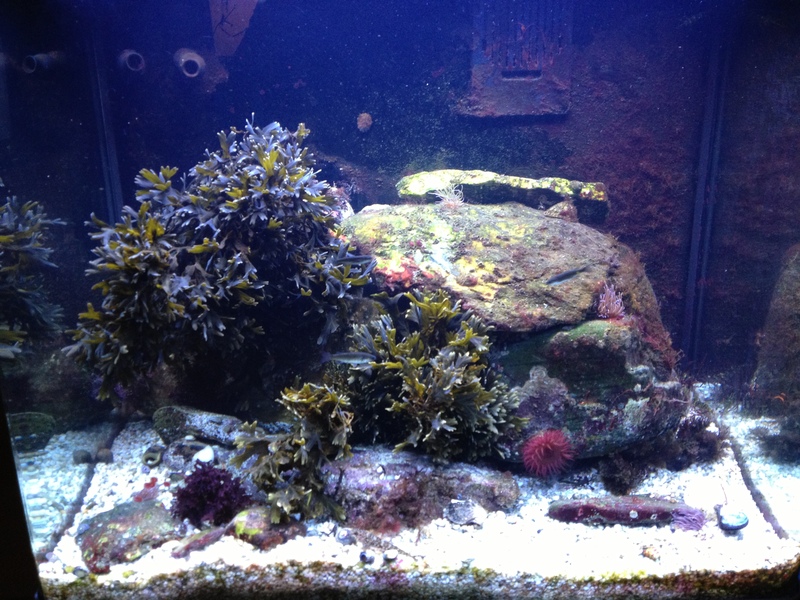 Up till then I had just planted seaweeds, but having them establish spontaneously I had not seen before. Most of the newly established weeds are only a couple of centimeters and do not seem to grow very fast, but the two weeds pictured above grew to 10 centimeters in a couple of weeks. 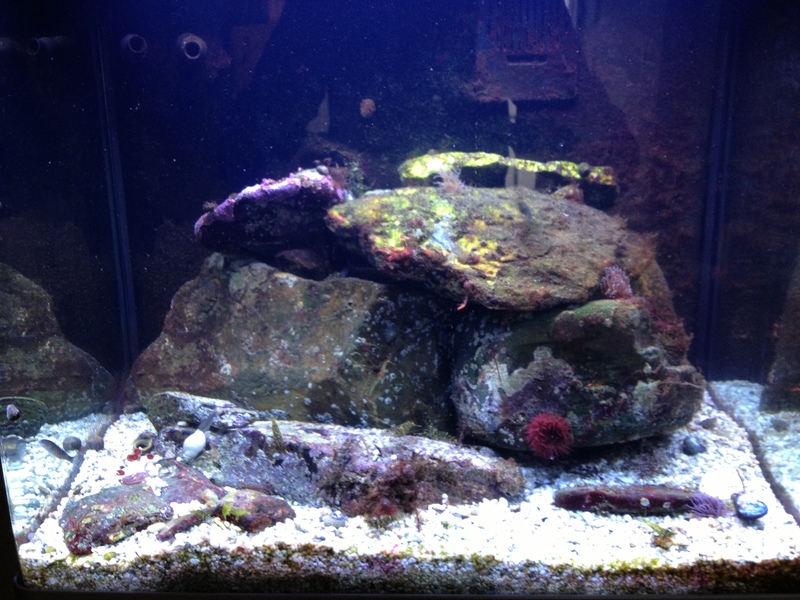 Perhaps very local conditions in the aquarium matter. This entry was tagged Actinia fragacea, Asparagopsis armata, Codium tomentosum, Dudresnay's whorled weed, Dudresnaya vertillicata, dulse, Fucus serratus, harpoonweed, Palmaria palmata, Sargassum muticum, Serrated wrack, Solier's red string weed, Solieria chordalis, strawberry anemone, velvet horn, wireweed. Bookmark the permalink. My name is Kenneth Wingerter. I write for a number of aquarium science publications, and I am currently completing a book on the subject of coldwater marine aquaria. The book will be self-published in the late summer or autumn of this year. 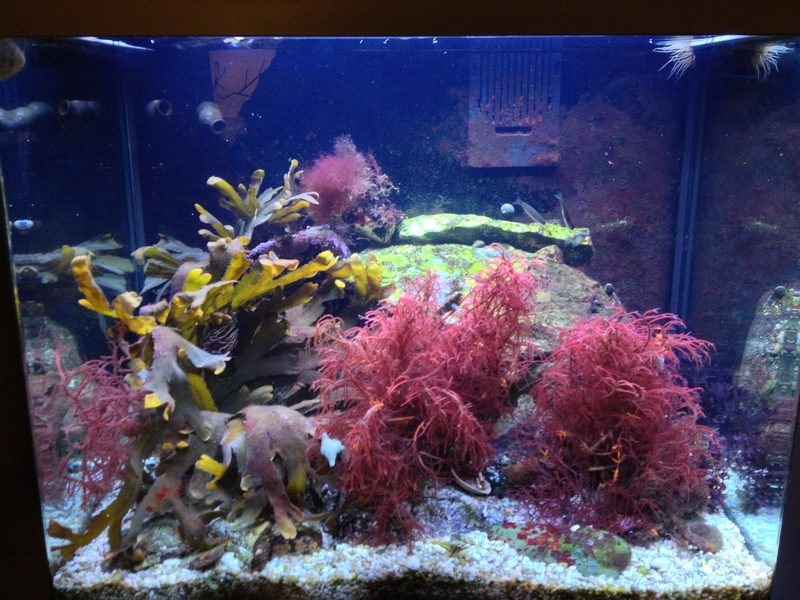 I very much admire your temperate marine aquarium system and would love to include a couple of photos of it in the book with your kind permission. If this would be okay, please let me know, and also to whom i may credit the images. thanks for the kind words. Of course, feel free to use the images on this site. I could email more pics and or info if needed, just let me know. looking forward to read your book! Yes, please send any original images to kennethwingerter@yahoo.com. Originals would indeed look far, far better in print. I’d love to include a full-tank shot. If you can, it would be greatly appreciated, but would have to happen pretty soon as I am now in the process of lay-out. Oh, and please remind me exactly how you wish the images to be credited. Thanks so much! Hi, Mick. 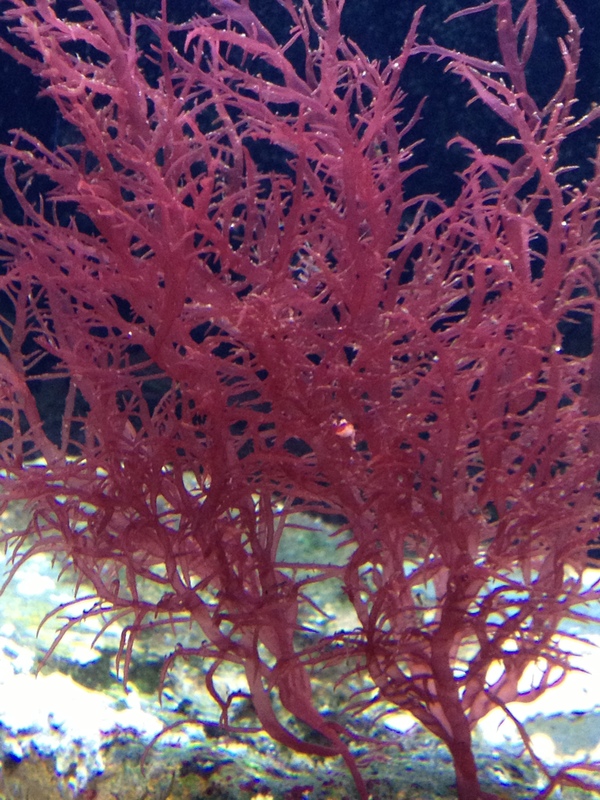 I recently submitted an article about macroalgae to an aquarium magazine (UltraMarine). It would be great if I could include one or two shots from your amazing website. Would that be alright? If so, please let me know. And if so, would it be fine to credit the image(s) to https://anbollenessor.com? Thanks again! Sure, will do! And thank you!